Acanthuridae ("thorn tails") is the family of surgeonfishes, tangs, and unicornfishes. The family is composed of marine fish living in tropical seas, usually around coral reefs. 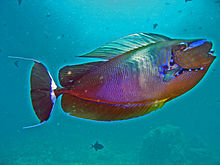 Many of the species are brightly colored and are popular aquarium fish. The distinctive characteristic of the family is the scalpellike spines, one or more on either side of the tail, which are dangerously sharp. Tangs are very sensitive to disease in the home aquarium. However if the tang is fed enough algae and the aquarium is properly maintained disease should not be a problem. It is usually necessary to quarantine the animals for a period before introducing them to the aquarium. Tangs primarily graze on macroalgae, such as caulerpa and gracilias, although they have been observed in an aquarium setting to eat meat-based fish foods. A popular technique for aquarists, is to grow macroalgae in a sump or refugium. This technique not only is economically beneficial, but serves to promote enhanced water quality through nitrate absorption. The growth of the algae can then be controlled by feeding it to the tang.